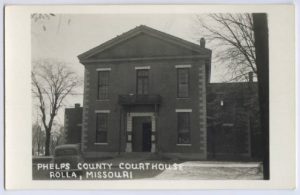 Phelps County, Missouri, was established November 13, 1857. The county was named for the honorable John Smith Phelps, then prominent Missourian and U.S. Congressman, and later governor of Missouri from 1877-1881. The first county court convened on November 25, 1857 in the John Dillon cabin. The historic courthouse was begun in mid-summer of 1860, used as a union hospital during the Civil War and served as the courthouse until February, 1994, at which time all county offices were relocated in the new Phelps County Courthouse. The new courthouse was dedicated on May 22, 1994. Read more about the local history.